2. 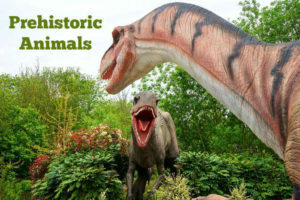 Which is the best known prehistoric animal? Answer: 150 feet (45 meters). Answer: 8 feet (24 meters). 6. Which are the remains of prehistoric life? Answer: Bones, shells and tracks of animals, as well as petrified wood and impressions leaves. Answer: About 600 million years ago. Answer: Time of visible animal life. 13. When did Phanerozoic Eon begin? Answer: About 544 million years ago. 14. Scientists divide the Phanerozoic Eon into how many eras? 15. Which are the three divisions in Phanerozoic Eon? Answer: Paleozoic Era, Mesozoic Era and Cenozoic Era). Answer: From about 544 million to 248 million years ago. Answer: From 248 million to 65 million years ago. Answer: 65 million years ago. 19. At present which era is continuing? Answer: Plants become available as food. Answer: Either plants or plant eating animals. 26. The earliest animals in the seas used which part for feeding, reproduction etc.? 27. Which are the first animals, known from fossils preserved in rocks about 600 million to 570 million years old? Answer: Jellyfishes, worms and leaf like creatures. Answer: Animals having no backbones.